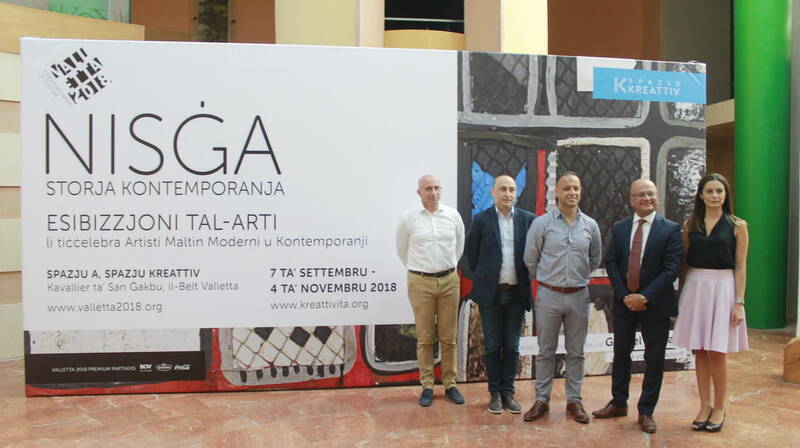 Several local works of art from different generations will come together in the shape of a dialogue between artists in Valletta 2018’s upcoming art exhibition; Nisġa – Storja Kontemporanja. The exhibition opens on the 7th of September at Space A, Spazju Kreattiv, St James Cavalier in Valletta. Nisġa: Storja Kontemporanja is an art exhibition that examines the multifaceted identity of the Maltese artist in six chapters. The Maltese word ‘nisġa’ connotes ‘weave’ and much like a piece of cloth, this exhibition is woven out of unusual narratives, connections and relations. This contemporary exhibition, curated by Alexander Debono and Irene Biolchini, seeks to create a virtual dialogue between some of the most prominent Modern and Contemporary Maltese artists. The collection includes the work of Josef Kalleya, Vincent Apap, Emvin Cremona, Esprit Barthet, Antoine Camilleri and Frank Portelli. These were acknowledged to be leading Modern artists in Malta: six modern artists (1991), compiled by Dominic Cutajar, Emanuel Fiorentino and Kenneth Wain. For Nisġa – Storja Kontemporanja, the work of these artists comes together with other artistic interventions from Contemporary artists, including Carmelo Mangion, Darren Tanti, Patrick Dalli, Pierre Portelli, Harry Alden, Anton Agius, Gabriel Caruana, Victor Agius, Austin Camilleri, George Preca, Alfred Chircop, Norbert Attard, Isabelle Borg, Vince Briffa, Raymond Pitrè, George Fenech and Ruth Bianco. Most of the contemporary works are found in digital format, creating an exhibition akin to an installation where all the elements converse and interact with one another. The exhibition presents meaningful dialogues between these pieces, each standing for a given narrative. The exhibition bridges artists across generations by featuring both works that employ traditional techniques as well as those which incorporate modern media. Set in a carefully curated space, the exhibition explores the persona of the Maltese artist, while also illuminating Malta’s connections to European and international art narratives. Valletta 2018 Chairman Jason Micallef said that “we are happy and proud to be giving the public the opportunity to view this collection of local works of art all together in one exhibition free of charge. The selection or works will create a significant dialogue: a dialogue between several artists, some of whom are no longer with us”. Parliamentary Secretary for Consumer Protection and Valletta 2018, Dr Deo Debattista said that such displays are a full spectrum of emotions that continue to enhance this unique emotion that is Valletta 2018. Entrance to this seminal art exhibition is free of charge. Nisġa – Storja Kontemporanja takes place between the 7th September and the 4th November 2018 at Space A, Spazju Kreattive, St James Cavalier Valletta. The exhibition is also part of the Spazju Kreattiv Programme.